One loves the arts, another computers and the third has an eye on the Navy. All of them found their fit at one college: TCC. Three giant tuition bills all at once. That didn’t add up for triplets Hope, Steven and Perry Drew. Enrolling at Tidewater Community College for two years before transferring to a four-year university made all the sense in the world both economically and academically for the Nansemond River High School graduates. “It’s kind of hard to pay for three people at once. And he can’t decide what he wants to do,” Perry said pointing to Steven. Hope is working toward her Associate of Arts in Studio Arts. Steven is pursuing his Associate of Science in General Studies. Perry is earning his Associate of Science in Science with a Specialization in Computer Science. All say they will likely transfer to Old Dominion University, though Hope is considering Virginia Commonwealth University. Together they participated in the Bridge Program last summer on the Portsmouth Campus that acclimated them to college life, making for a successful transition. “You learn about all the resources you have,” Perry said. “It helps to know your way around; we don’t get lost,” Hope said. Steven and Perry work nearly full time and have been able to build their class schedules around their jobs. They like the small class sizes and personable professors. Hope’s load includes three classes at the Visual Arts Center, where she especially enjoys the introductory course, Fundamentals of Design. She also enjoys drawing with Professor Rob Hawkes. Hope would like to teach art or work in a museum. Steven plans to join the Navy after college with the plan to work in public affairs. Perry wants to be a computer hardware engineer. 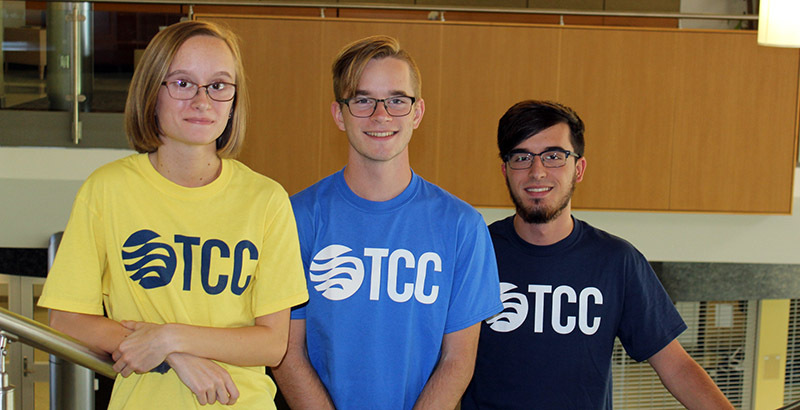 The Drews recommend TCC to other recent high school graduates, and while the semester is still young, they share this advice. “Don’t slack off,” Steven said. “Don’t be late for classes,” Perry added.